A new Africa-wide programme aims to support the development of a vibrant, market oriented and pluralistic seed sector in Africa. 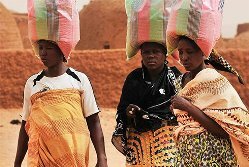 Access to quality seed remains a great challenge for smallholder farmers across Africa. This affects their agricultural productivity, income and resilience. Addressing this challenge is a complex task and cannot be done at national levels alone. The Comprehensive Programme on Integrated Seed Sector Development in Africa (ISSD Africa) aims to enhance reliable access of smallholder farmers to sufficient quantities of quality seed of superior varieties at the right time and at an affordable price. Addressing these themes will be done through action research, innovation trajectories, policy dialogues, capacity strengthening, and joint learning in eight to ten pilot countries.